Tips from the kitchens of France, Italy and Holland offer this simple salad some sophisticated continental twists. 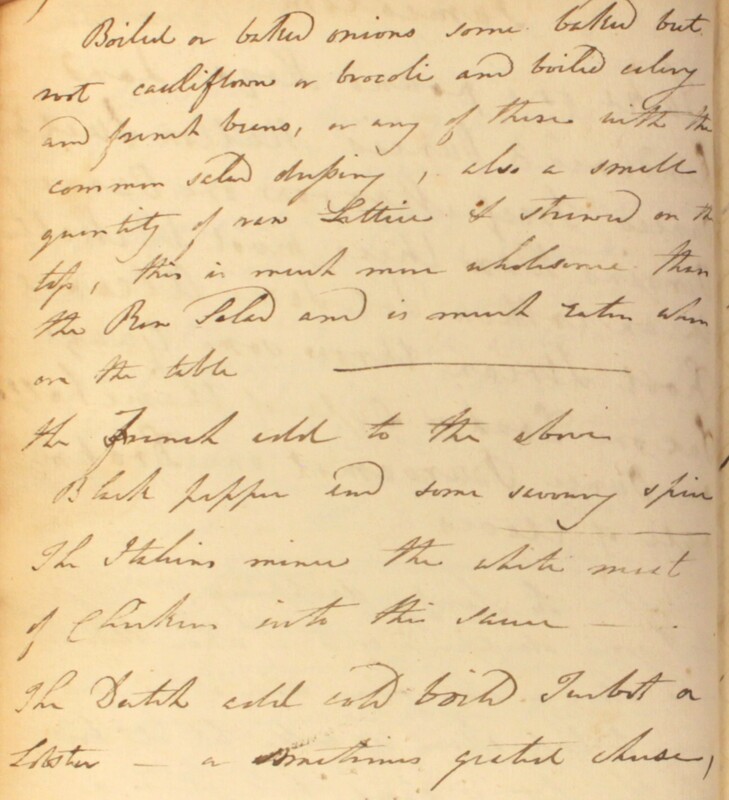 Today’s recipe originally appeared in William Kitchiner’s Cook’s Oracle, first published in 1817. This cookery manual was aimed at British and American ‘plain cooks’, and was principally concerned with the preparation wholesome meals with good economic sense. However, Kitchiner was also careful to acknowledge new fashions in food, and many of his recipes showed how the cook could balance gastronomic tastes with abstemious habits in household management. Boiled or baked onions, some baked beet root, cauliflower or brocoli, and boiled celery and French beans, or any of these with the common salad dressing. Also a small quantity of raw lettice &c strewed on the top. This is much more wholesome than the raw salad and is much eaten when on the table. The French add to the above black pepper and some savoury spice. The Italians mince the white meat of chickens into the sauce. The Dutch add cold boiled turbot or lobster – or sometimes grated cheese. As another cheap but flavoursome variation, Kitchiner also suggests that meat jelly could be used instead of an oil dressing. 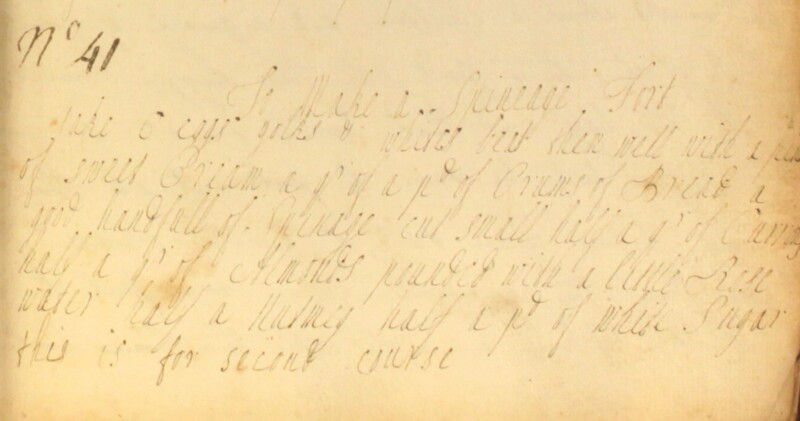 It’s very likely that our unknown ladies may have had jelly ready from preparing cow heel, another recipe in the Cookbook. It is another example of the Georgians’ knack for balancing a passion for good and exciting food with a tendency for thrift. Sweet spinach tart? It may be an unusual concept, but it is one that has weathered several centuries. In her Vegetable Book (1978), Jane Grigson writes that this dish still features among the treize desserts traditionally served in Provençal households on Christmas Eve. Grigson’s recipe recreates Southern French flavours by including some candied orange and lemon peel. Francophones can google “tarte sucrée aux épinards” for further variations and additions, including pine nuts and raisins. To Make a Spineage Tort. This is for second course. Take 6 eggs, yolks & whites. Beat them well with a pint of sweet cream, a qr of a pd of crums of bread, a good handfull of spinage cut small, half a qr of currons, half a qr of almonds pounded wth a little rose water, half a nutmeg, half a pd of white sugar. Half a pound of drawn butter, 3 spoonfulls of brandy. Mix all well together. Lay paist thin at the bottom & sides of the dish & cross bar at top. 3 qrs of an hour bakes it.